In der Ignaz Joseph Pleyel Gemeinde Ruppersthal wird bereits seit dem Jahre 1908 Theater gespielt, deshalb feierte man im Kultur- und Weinort Ruppersthal im Jahr 2008 den 100. Geburtstag mit dem Singspiel "Im weißen Rössl" von Ralph Benatzky. Ferner wurde ein feierlicher Festakt mit Festmesse mit Diakon Hans Wachter begangen. Die Festansprachen hielten der Bezirkshauptmann des pol. Bezirks Tulln, Hofrat Mag. Riemer, der Abgeordnete Mag. Peter Eisenschenk, Vizebürgermeister Direktor Leopold Spielauer und als Vertreter des ATINÖ, Mag. Walter Lexmüller. Die Begrüßung des IPT übernahm die Präsidentin des Theatervereines Theresia Hitzinger. Die Ruppersthaler Theatergemeinschaft wurde von 1908 bis 1991 als Gruppe geführt, ehe Adolf Ehrentraud am 8. 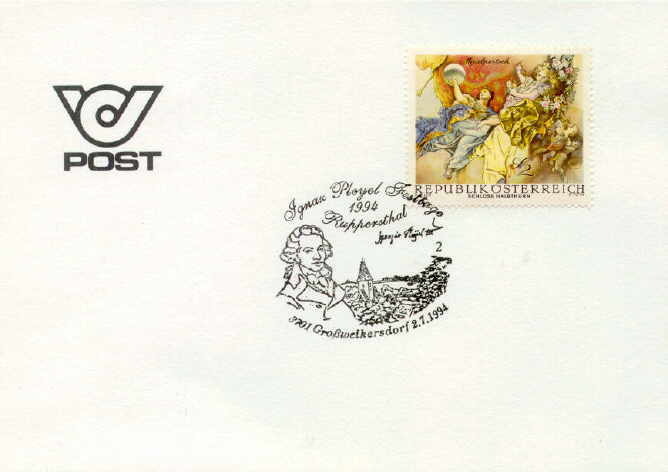 November 1991 zur Gründungsversammlung des Vereines lud. Why does Ruppersthal have two Pleyel Societies? Whereas the drama society deals with the living theatre, and this for a century, the goals of the IPG are the research and interpretation of the life and work of Ignaz J. Pleyel, as well as the regular performance and presentation of his works. A major focus area is the guided tours in the museum. Both societies are now jointly pulling at one rope and have thus become a single "Pleyel Family". In was only in this way that in the course of the restoration work for the museum, personal contributions totalling 100.000 Austrian Schillings (approximately 7.200 Euros, or GBP 5.000, or $ 10,000) could be collected. 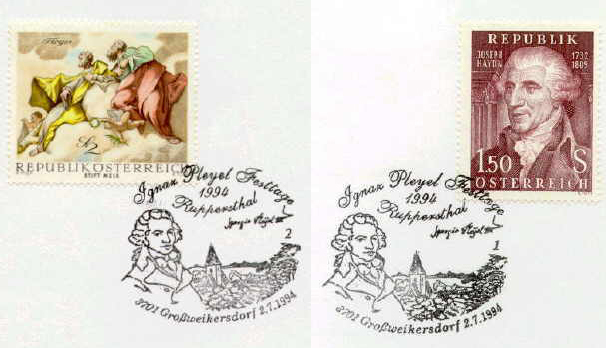 When comparing the statutes of the Ignaz Pleyel Drama Society Ruppersthal 1908 (IPT) with those of the International Ignaz J. Pleyel Society (IPG), many common points emerge, as both organisations are working on the biography of the composer Pleyel and striving to make him better-known, as well as maintaining his museum in Ruppersthal (former Pleyl-School). Everything began with the Drama Society: on 25 October 1993 the Director of the Ignaz Pleyel Drama Society (IPT), Adolf Ehrentraud, decided to write a documentary play on the life of Ignaz J. Pleyel, which was performed in June and July 1994 by the IPT in front of the composer's birth home. Along with the play "Ignaz Joseph Pleyel - the forgotten son of our homeland" by Adolf Ehrentraud, a church concert, a festive ceremony, a field mass and an exhibit were organised. The church choir sang the "Missa in D-Dur" (Mass in D Major) by Ignaz J. Pleyel. Prominent guests had come to attend the ceremony (among them District Councillor Dr. Peter Partik, Prof. Paul Angerer, the President of the State Organisation for Amateur, Youth and School Theatricals, Mag. Ewald Pollacek, Prof. Dr. Richard HÃ¼bl, and many more). In 1995 the IPT repeated the effort, and in 1997 a festival was organised as a joint production by the International Ignaz J. Pleyel Society (IPG) and the IPT.